Up until a few months ago I didn’t like sake and perhaps it is just because I had a bad experience with the brand of sake and the fact that it was heated, which I didn’t like. However, I decided to give it another try and discovered a vast variety of sake and that I did like it! Since I make quite a bit of Asian food, it is a great pairing not to mention a great alternative than the beer or plum wine I generally drink with the meal. Hana –Awaka Sake (Japan) is shown and the name Hana –Awaka means sparkling flower! There are several different flavors of sake for you to choose from that are sparkling (think fizzy) which means carbon dioxide is added. 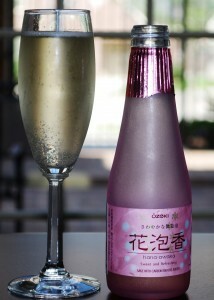 This type of sake is sweet and of course sparkling similar to sweet Champagne with sake flavor and plum wine flavors. Sake pairs perfectly with spicy Asian dishes. This type of sake should be served chilled. Ty∙Ku Super Premium Junmai Ginjo Sake is FANTASTIC! This one was a big surprise because it is a more traditional type of sake, but it has an extremely smooth sake flavor! I have even done some taste testing on friends who say “I don’t like sake!” and I say “Just give it a try!” To their pleasant surprise they admit it is super smooth and liked it! This sake should also be chilled and it says it can be used like vodka to make mixed drinks. I have tried mixing it with various juices and was very pleasantly surprised at the flavor it can add to simple mixed drinks! Give sake a try and let me know what you think or if you have a favorite brand please share with us!